Upgrading from a hard disk drive (HDD) should be easy and affordable and that's where Toshiba OCZ TR200 Series SSDs come in. 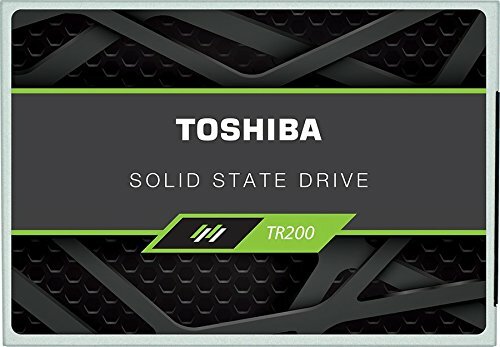 Designed to boost the speed of your notebook or PC over conventional HDDs, the TR200 Series leverages Toshiba's advanced 64-layer 3D BiCS FLASH, to deliver well-balanced performance, reliability, and value that will transform your mobile or desktop system. Instant Performance Upgrade- Up your productivity with the TR200 Series and enjoy faster boot ups, file transfers, and system responsiveness. Say goodbye to hard disk drive lag and get a computing experience worthy of your time. State-of-the-art Storage- With a 64-layer vertically stacked cell structure, Toshiba BiCS FLASH technology enables higher capacity, endurance, performance, and efficiency in the same footprint, delivering a state-of-the-art storage experience. Improved for On-the-Go- Compared to hard disk drives, Toshiba OCZ TR200 SSDs also offer improved durability and power consumption, which can translate into longer battery life to keep you up and running longer.